As you know, we live in a desert, where water is scarce. In Arizona, we get our water from four main sources: surface water (lakes, rivers, streams), the Colorado River (separated out as it's a unique case), groundwater (where 43% of our water comes from), and reclaimed water (treated waste water used for agriculture, golf courses, parks, etc.) (Source: AZ Department of Water Resources). Of these four sources, only reclaimed water is increasing, and that's unfortunately due to our own population increases and the corresponding increase in water use. When you use more water, the silver lining is that the city gets more waste water. Our state is currently pumping out groundwater more quickly than it can be replenished, the term for which is particularly financial sounding: "overdraft". The Colorado River is shared by many western states, as well as Mexico, for their water needs, but this arrangement has the possibility for water conflicts in the future. And since our climate is particularly hot, surface water availability varies a lot, though storage reservoirs help mitigate this risk. Who is using all this water? Please click on this link again and flip to the pie chart on the last page of the document. It shows that 70% of Arizona's water is going towards agriculture. While we flip the bird to the Creator to say, "Hey, eff you buddy, we can grow crops in a desert," a full seven tenths of the water available is being used to cultivate lettuce, cotton, citrus, and to quench the thirst of cows (our leading agricultural product). Obviously, less water could be used to grow the same crops and cows elsewhere. As for the rest, 8% of the water is used for industrial purposes, and 22% goes to residential use. For a little more context, here is exactly how much water goes towards agriculture: 4.4 million acre-gallons of water, every year. Never heard of an acre-gallon? Me, neither. One acre-gallon is 325,841 gallons. A single acre-gallon is estimated to be sufficient to meet the water needs of a family of five, for an entire year. Let's bust out the calculator. 1,433,744,400,000 gallons, every year, in just my state, and only for agriculture. While the amount of water being used to grow crops in the desert might make me doubt the benefits of eating locally, there's not a whole lot I can do about it as an individual consumer. What I can focus on is my part of the consumption: the twenty two percent being used by residents. Navy showers can save up to 15,000 gallons per person, per year, compared to a conventional shower. Sure, that is a paltry amount compared to the total water usage and doesn't likely result in huge savings, either. (It looks like a year of navy showers would only save us about $90, as a couple.) But it does help, and it is more efficient, and like CashRebel says, efficiency is beautiful. Give your dishes a navy shower, too. Get them all wet, turn the faucet off to soap & scrub them all, then give one rinse at the end. Integrate native trees & plants that need infrequent watering. Water plants deeply & less frequently. This uses less water overall and adapts plants to sustain longer periods of drought. We are in the planning stages of building a homemade grey water system that will use the water from our washing machine to water the plants in the backyard. I'm in receipt of a booklet from the city that outlines the regulations, and there are still some kinks to work out regarding the installation and how best to get the hose from the laundry room to the yard. But in a few months time, and some luck, we'll be able to reuse that water! I'll throw up a post on the set up once it's all complete. *Photo is from PhotoAtelier at Flickr Creative Commons. This is particularly topical as I read Bottlemania by Royte which start about bottle water from maine, but then looks into the water in NYC (one of five cities in the US that don't have to filter their water). I'm finding it incredibly interesting, if a little US centric (as an Aussie). On washing up - I just run a sink - I wonder how that compares to your navy method (or the running tap method). Also watering before the heat of the day, and after it, is optimal. Good point about when to water -- I should have mentioned that! Bottlemania sounds interesting. I'll have to add that to the list. I think it's awesome you're doing what you can to conserve water! Thanks! They're little things but hopefully they help. Gosh these sorts of posts make me feel bad. When we bought our house we found out that when you take a shower the plug from the bath spout is broken. Shower still works, just a decent amount of water rushes out of the spout...which is a total waste of water since it is serving no purpose whatsoever. We have a contractor coming over tomorrow to take a look at it - among other things - to get estimates. Hi DC! I'm glad you stopped by, and really didn't want to make anyone feel bad about water usage. I don't think it's as big of an issue in other places, and I hope the repairs go well. Totally understand what you mean, even though I don't partake in the full navy shower. (But I do shut the water off when I shave my legs in the shower.) I was the weird girl when I went off to college and in the dorms would shut off the water faucet if someone was sitting there brushing their teeth with the sink running full blast. Just turning off the faucet while you brush saves 8 gallons/day per person. Low flow showerhead technology is also getting a lot better, too. It's not just an issue in deserts. In FL we need to worry about this kind of stuff as well until desalination technology gets better and cheaper, we're draining aquifers and some people blame sinkholes in the center of the state on drained aquifers there! I hadn't heard about the sinkholes possibly being the result of drained aquifers. And your story about turning off other people's faucets in college is kind of awesome (and funny!). Haha I like the "navy shower" name. I am not big into long showers either. Get in. Get out. Get on with your life. A hot shower is something that I'm willing to pay extra for! I consider it part of my entertainment budget. I also love hot baths....Calgon, take me away!!!!! And it's a very cheap part of the entertainment budget, too, I bet! We rent so we don't pay for water but we do try to conserve to be environmentally friendly. The water we use to wash fruits and vegetables we sometimes use to water our plants. And we don't use the dishwasher...rinse, soap and then rinse again. It pains me when I see people brush their teeth and leave the faucet running! Great tips - I don't partake in navy showers, but I do clean up quickly (I must have been a cat in a previous life :)). A cool trick my friend taught me is to have a bucket underneath the faucet while you're waiting for the water to warm up, then use it for watering your plants, soak your dishes to get things unstuck, etc. That's another great tip! These days I really enjoy the cold water so I just jump right in, but after the summer I'll give that a go. We've adjusted to our house's quirks by using technology. I spent a lot of time in a desert (El Paso, TX), and I still try to conserve water, even though we live in an area that has abundant (and cheap) water. Also due to the length of the run, we have no pressure in the shower, and I need pressure to get all of the soap out of my hair - I spend more time rinsing my hair than I do the rest of my shower, and I wish it took less time. We've started with a "camp" shower head, designed for low-flow operation (also water-saving), but we're looking at putting a separate pump (or replace the circulating pump) near the shower to bring up the pressure there. 10-15 minutes for hot water is quite a while! 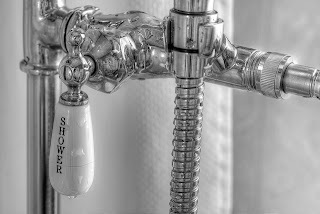 These days, my showers are all cold -- we could probably disconnect the water heater! I like the idea of a low-flow shower head. That probably helps both the water pressure and water consumption at the same time. simply awesome, great post (y) spcaily the water saving topic are good one think.